A wave of diplomatic efforts is under way to get senior figures in American politics to weigh in behind Ireland's position in the Brexit negotiations. Having so far kept European capitals on board with the backstop, the Government is now hoping the US and Canada will pressure Theresa May into "protecting the Good Friday Agreement". 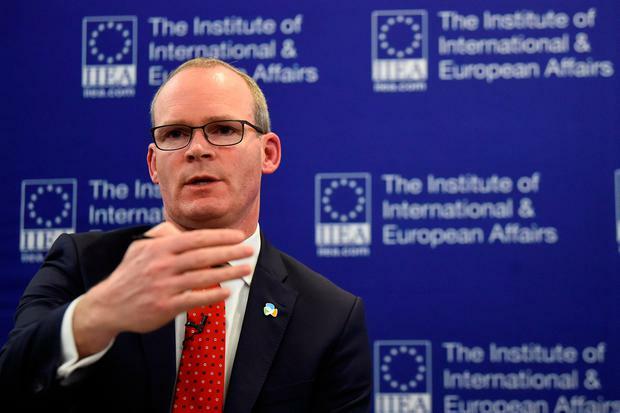 Tánaiste Simon Coveney will travel to Washington next week where his itinerary will include holding meetings with senior figures in the White House and the speaker of the House of Representatives, Nancy Pelosi. A source said: "The US is hesitant to get in the middle but it's a sleeping giant in terms of preventing a hard border. The Good Friday Agreement and peace in Ireland is one of the cornerstone achievements of US foreign policy, they're watching every move." Irish-American congressman Brendan Boyle will also table a motion in the House of Representatives opposing any re-establishment of a hard border. The Democrat representative described the 1998 peace treaty as "one of the great foreign policy achievement of the 20th Century". Taoiseach Leo Varadkar has already secured the support of Canadian Prime Minister Justin Trudeau in his battle with the UK government. It has emerged that the two leaders discussed the situation on Wednesday evening. While Mr Varadkar did not publicly reveal details of the call, the prime minister's office issued a brief note indicating that Mr Trudeau was siding with Ireland in the dispute. "The two leaders discussed the implications for Ireland of the UK's withdrawal from the European Union," a statement read. "They agreed on the fundamental importance of protecting the Good Friday Agreement for the peace process in Northern Ireland, and recalled Canada's role in achieving the agreement." Diplomatic sources told the Irish Independent that any intervention from North America would be carefully monitored in London. The US and Canada are both high on the list of countries which the UK wants to strike trade deals with after Brexit. US president Donald Trump's aides are in the process of laying the groundwork for trade talks. However, any discussions on future deals between the two countries are unlikely to start in earnest before the EU and UK resolve their own future relationship. Another source said the US State Department took great pride in its work on the Good Friday Agreement. Mr Boyle has already appeared on British media to highlight his resolution, which is expected to gain cross-party support. He has claimed that preserving an open border in Ireland and the Good Friday Agreement has bipartisan support even in what has become a highly partisan Washington. In a statement, Mr Boyle recalled how US special envoy George Mitchell was heavily involved in ensuring the Border came down. The congressman also issued a warning that if the UK reneges on its Good Friday Agreement commitments, "it will have an impact on any future negotiations between the US and UK". "It would be naïve to think otherwise,'' Mr Boyle added. The Irish Embassy in Washington is currently finalising a programme of appointments for Mr Coveney's visit to the US capital next week. It is understood to include a series of meetings with senior congressional and administration representatives as well as key figures in the Irish-American community.